Compassion means we care about others, treat them with kindness and feel a strong desire to help people in need. Compassion is empathy in action. For a two-year-old, compassion might look like giving a hug to a friend or family member who feels sad. Noticing someone else's distress and wanting to respond is the foundation of compassion. Children are sometimes wary when they encounter people who look, sound or behave differently than those in their immediate circle. Children are sometimes wary when they encounter people who look, sound or behave differently than those in their immediate circle. And young kids sometimes ask questions or make statements that parents find awkward or embarrassing, such as "Why is she in a wheelchair?" "How come he talks like that?" or "That's a funny-looking outfit!" "Don't come down hard on your kid" for sharing these reactions, says Harvard psychologist Richard Weissbourd. Instead, listen empathetically and talk through their questions. Ultimately, he adds, "the best way to assuage children's fears is to engage [those we meet] in a very normal way." In other words, children take their cues from adult reactions. In the "Daniel Tiger's Neighborhood" episode "Daniel's New Friend," Daniel has lots of questions when he meets Chrissie, who uses braces to help her walk. The episode's "strategy song" provides simple language parents can use to help children: "In some ways we are different; in so many ways, we are the same." Use descriptive praise when you see your child reaching out to someone else with compassion. "I was sad and you gave me a hug. That hug helped me feel better. Thank you for being so kind." "You shared your toy trucks at the playground. That was kind and made your friend feel happy inside." Playing dress up can help your child develop imagination and creativity. In this game, your child can put together fun and creative outfits for Daniel Tiger and his friends. 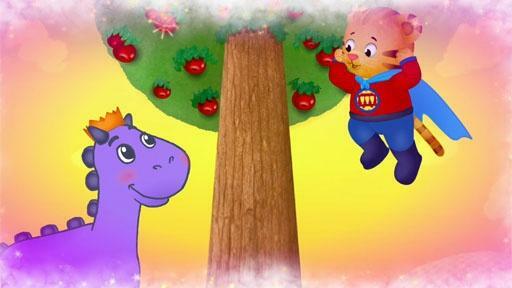 Daniel imagines that he is Super Daniel helping the friendly dragon reach the apples.